ROBE-SHOP.COM is your specialist for graduation regalia and accessories . We supply exclusively high-quality robes to leading domestic and international schools,	colleges and universities. The most exclusive academic robes are worn not only by national dignitaries but also by professors, deans and university presidents worldwide. We offer exclusively all graduation products and services from FIT4GRAD, COLLEGE FASHION as also other favorite brands as HOLLAND & SHERRY, Loro Piana, MANUFAKTUR BAVARIA, Scabal and TIMELESS | bespoken in the US market. TIMELESS | bespoken represents first-class, good value clothing. Our products and services combine the advantages of traditional tailoring and the excellent properties of high-quality materials. 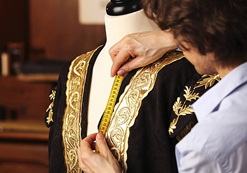 Our studios provide an exclusive tailor-cut of your robe. All our products are made by skilled dressmakers clothing with accurate individual production. TIMELESS | bespoken deliver the robes in prefabricated standard sizes and also as individual customization. Our standard program includes robes well over 100 different models - from gowns for spiritual institutions worldwide to equipping the US judiciary till high end academic regalia gowns. In addition, we can also customize any other robe for you at any time. Our manufacture produce as high-quality academic gowns for leading colleges and universities as well as extensive clerical robes. Our product portfolio serving officials, dignitaries and institutions globally. As a global supplier for everything to do with robes, we are conscious of our social responsibility towards our customers, business partners and subcontractors on a daily basis. That is why we make sure to focus our attention on our employees, offering them a secure, fair workplace and also on the ecological effects of our activities. Concerning the responsibility for the economy as a whole which we are now taking on, particularly for future generations, we see several aspects as being of the highest priority. These include, for example, fair, secure working conditions for our employees, equal opportunities, basic and advanced training, entrepreneurial innovation, commitment, and an emphasis on the environment, culture, further education, and sports, willingness to donate to charitable institutions, and finally, of course, customer satisfaction by paying attention to a customer service and complaint management that we can be proud of. It is one of the very important principles of our company that we constantly define and implement new benchmarks, and that we consider further overall aspects in doing so, and we hope that our interested customers are aware of the significance of this, and that they share our values.